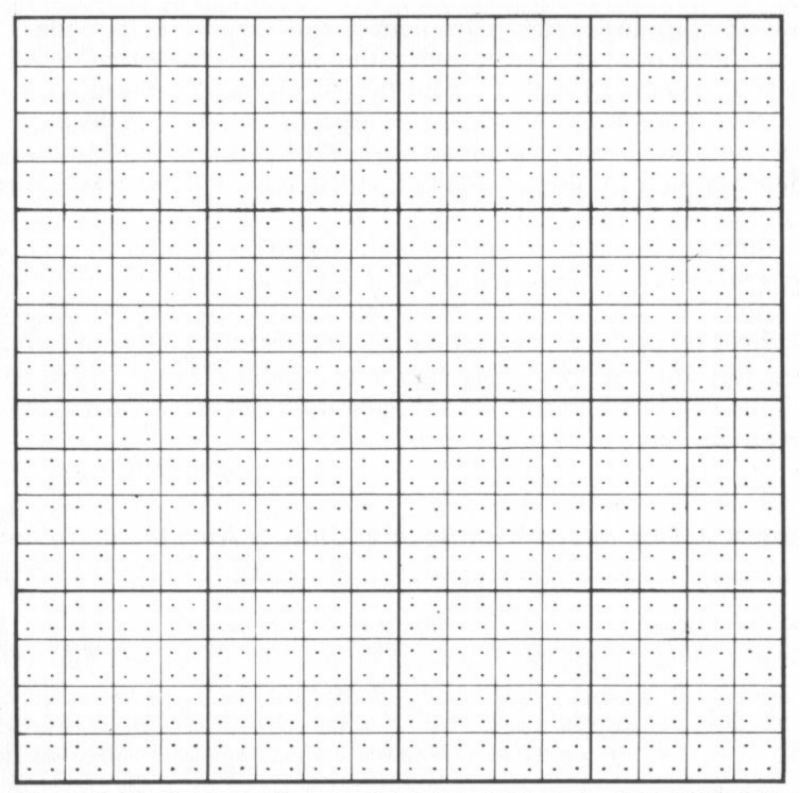 Dot grid area estimations involve laying a transparent grid over an area of interest and counting the grid cells or dots that fall within that area. This is a quick and easy way to estimate areas, or to estimate the density of objects, and is relatively easy to understand. 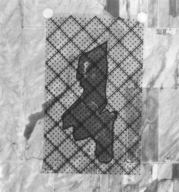 Each dot or grid cell is proportional to an area according to the scale of the source image, summing the number of dots or grid cells and multiplying by the scale conversion allows you to quickly estimate areas. The graphic on the left, below, is an example of the dot grid overlay method (with the information given you could answer the question). Remember that the answer requires areal units, so they are squared, and that the scale given is a linear scale (i.e., not an areal scale). On the right is a standard dot grid. Note that if this dot grid is printed the darker lines are intended to be one inch apart--you would need to resize this graphic if you are going to print it onto transparencies. 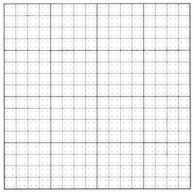 The dot grids you will be using in Lab 1 are one inch grids with 100 dots per grid cell. A 1:20,000 scale photo. Each square contains 25 dots and is 1 cm on a side. How big is this lake? Dot Grid. You need to scale the grid cells relative to the photo being measured (i.e., determine its real world area) and divide by the number of dots within each grid cell (i.e., how much area each dot represents). The diagram below (not related to the figures above) illustrates the dot grid method for estimating area. 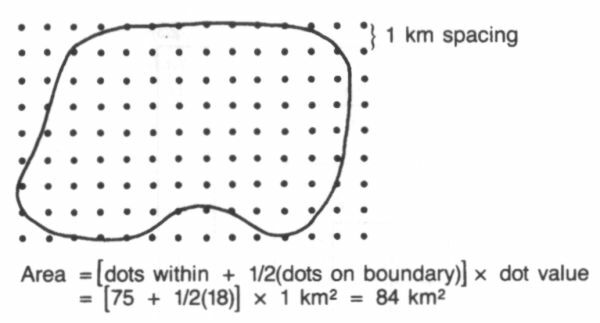 The ground spacing was determined to be 1 km (i.e., the spacing between the dots was determined to represent 1 km on the ground at the scale of the photo being used; therefore each dot represents 1 km²). Dots that fall along the border contribute only half of their area to the total (i.e., the total of all border dots is multiplied by 0.5). For each airphoto, you first need to determine what a 1 inch square on the photo represents in terms of area on the ground (think back to your methods in question 1). Be sure to convert your answer into hectares. Divide this answer by the number of dots in the 1 inch square to determine the area that each dot represents. Count the number of dots within the field on the ground (counting every other dot for those that fall on the border). Multiply the number of dots by the answer that you obtained in step 2. Distance-unit conversions are important to understand; it is not necessary to memorize all of them but you should be aware of the more common ones. Also, it is important to get a grasp of the magnitude of some units relative to other units; if you're converting from feet to metres, should the resulting number be bigger or smaller? If you are not familiar with unit conversions, or you are calculator dependent, you may need some practice setting up the calculations so that the units turn out appropriately. If one inch on the photo is equivalent to 1,000 feet on the ground (or 12,000 inches): RF = 1/12,000; the map scale denominator is also equal to 12,000. The 12,000 part is what is important; that is, the real world distance per unit distance on the photo or map. The units used in making your measurements don't have to be inches, they can be millimetres, centimetres or whatever. The important part to remember is that both terms will be inches, or cm, or whatever unit you choose, and therefore the resulting fraction is unitless. The important thing to keep in mind, once you have mastered measuring distances, is that areas are expressed in squared units. For a rectangular area it is length x width, so if you measure both length and width, and convert these distances, remember that the resulting units are squared. For example, if an area is 100 metres by 500 metres, it is 50,000 square metres. Now, if you wanted to change that number to square feet its not multiplied by 3.28, it should be multiplied by 10.76 (3.28 x 3.28) (recall that there are 3.28 feet per metre). Also, it helps to think it though: if you're converting from square metres to square feet should the resulting number be bigger or smaller? Knowing units and distances will help you learn how to arrange the calculations and to recognize incorrect calculations. The precision of a measurement is dependent upon your ability to determine photo scale, the precision of the conversion factors, the precision of the measuring device (e.g. using a standard 12 inch ruler or a millimeter-scaled ruler) and the accuracy with which you can determine the edges of a feature or area. 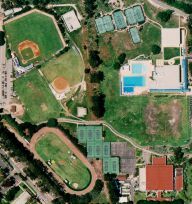 Athletic fields have standard dimensions, you can use these lengths to calculate photo scale. This information was extracted from Volume 1 of the Remote Sensing Core Curriculum, Module 4: Scale and Area Measurement (which is unfortunately not available anymore).